First grilled burger of the season! Topped with homemade pickles, asiago, and broccoli sprouts. We've been eating well as always. Thank you life for being so damn good. My best food news is that grilling days are here again. F the snow, hail, sleet and rain. I've planted my peas, sown my arugula and I'm stoking up the grill. I'm still cooking a lot of great food from Vij's Cookbook because I love it. I'm enjoying cooking from books more lately since we're about to begin recipe testing for the Toro Bravo Cookbook. Since I use cookbooks more as go-to for ideas and don't strictly follow recipes all that often any more it's nice to have a reason to do that again in preparation. Momofuku here I come! Hope you're eating well too. Let me know what you've been cooking in the comments if you have a second. Open-faced egg and ham with cheddar and broccoli sprouts. Homemade shrimp/pork posticker soup with kimchi, beet greens, tomato and Meyer lemon juice. Vij Cookbook black chickpea curry with toasted cumin seed basmati and homemade raita. 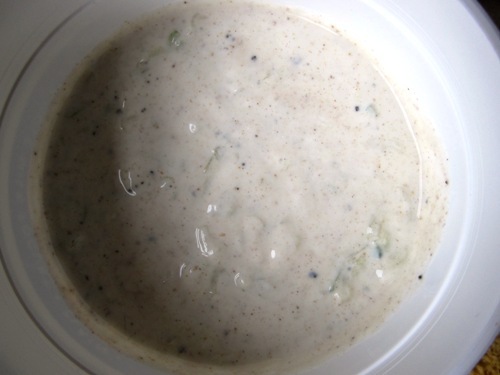 Vij Cookbook raita -- yogurt, whole grated cucumber, garam masala. Roasted chicken with fresh herb butter under skin, roasted beets, turmeric rice and quick reduction with white wine. Leftover turmeric rice with chicken reduction and basted egg. More pickled beets and onions because I can't help myself. So good.